Facilities: I-44 Horse Hotel is finally open! We are conveniently located about 45 miles northeast of Tulsa, Oklahoma with VERY EASY access to I-44. I-44 Horse Hotel offers comfortable and safe accommodations for those traveling with their 4-legged friends. 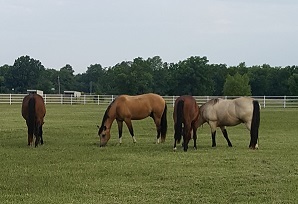 Whether you prefer to sleep in our fully-furnished bunk room across the hall from your horses or in your RV/trailer parked just outside the barn, you'll rest comfortably knowing your horses are enjoying a much needed rest from the rigors of traveling. The longest rigs can easily pull in/out. Our two RV pads have water and both 30 and 50 amp electric service. 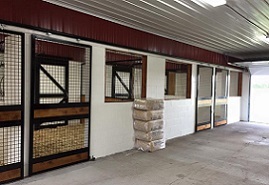 We offer 5 inside stalls with rubber mats and 5 covered outdoor stalls. A large turnout pen is also available. Come stay with us; we are confident you'll be glad you did! Give Travis a call at 918-323-1555 and schedule your stay! RV pad = $35; inside stall = $25; outside stall = $20; bunkroom $75. Pine Shavings $6/bag, 1 bag minimum per stall required. Location: We are located 1/2 mile west of Interstate 44 on OK-28, which is about 45 miles northeast of Tulsa, Oklahoma. 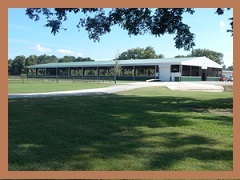 Facilities: 6 Covered stalls, 18 outdoor pipe corrals, arena, room for large vehicle parking with 10 electric hook ups. Bedding, water buckets and feed buckets are not provided. Under new Ownership but same great service!! Location: Off I -40 take exit 66, go north 5.6 miles on hwy 183Y. You will get to a tiny town called Arapaho; pass the gas station, go about .3 miles and on the left take road 990 and go west 1.2 miles. Our house is on the right; it's a white, two story farm house. Facilities: Inside stall, turn out pens, hot walker, RV hook ups, covered arena. Inside stalls (shavings, waters included) $25 per night. Turn out pens for over night board $15. RV hooks up is $15 per day. We offer a monthly rate also. We do not supply feed. Location: 5 minutes off I-35, just south of Ardmore, O.K. We are 90 minutes from the Fort Worth stockyards and 90 minutes from the OKC farigrounds. 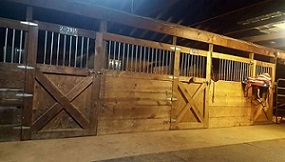 Facilities: The Ranch has 8, 12' x 18' stalls in the insulated barn and another 3 12' x 12' stalls in a separate, partially closed barn and 12 outdoor covered paddocks with adjacent pastures. The stalls are bedded with wood shavings over rubber mats. Check-in and check-out times are flexible, but are limited to a 24-hour period. RV/trailer 30/50 AMP electrical and water hook-ups available. Restrooms and shower facility. The ranch can handle your large rig. Bed & Breakfast cottage available for nightly rental. Included with overnight board: * Heated wash bay * Arena use must be scheduled in advance and limited to one hour per day. A current negative coggins and health record is required. 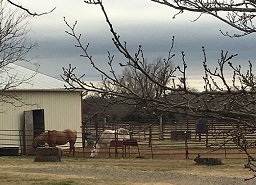 Unmanageable or incompatible horses, which create problems for the Ranch, clients or their horses, or destroys Ranch property will not be eligible to board and must be removed from the property immediately. 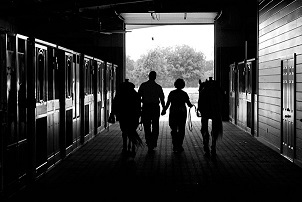 Horse owners are financially responsible for any damage to the facility by their animals. All boarding charges are due upon arrival. Cash or Credit Card w/Convenience Fee for overnight boarders. 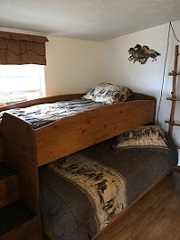 $40/night for insulated barn stalls, $40/night for partially enclosed stalls, $15/night for shelter/pasture board, $25 Overnight Fee regardless of facility use, $100.00/night for the Main Cottage with add-on options of 2 additional bedrooms and Dinner & Breakfast Meals. 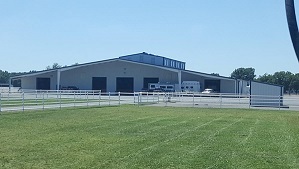 Facilities: 22 12' x 12' stalls in an insulated barn, 3 12' x 16' stalls with attached runs, 5 12' x 12' stalls with attached runs, 6 appr. 1 acre pasture with 15' x 30' 3 sided run in, 60' x 100' covered arena. 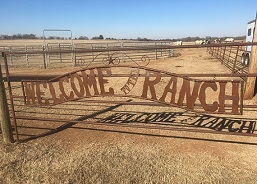 Location: Conveniently located less than a mile off of I-40 at Radio Road, east of El Reno. Facilities: In our RV park we offer 80' Pull-Thru sites with 30/50 amp and full hook-up. We have a Banquet Hall with full kitchen, swimming pool, dog parks, storm shelter, picnic areas, laundry facilities and propane. We have a huge storage facility where we offer boat, RV, and mini storage. In our Horse Resort area we offer 70' Back-In sites with lake views, bathrooms with showers, laundry facilities, picnic areas, walking and riding trails. We have individual pens, stalls and a round pen for the horses. Location: From Eufaula, OK we are 4 miles north on US Highway 69. From Interstate 40 at Checotah, OK we are approximately 8 miles south on US Highway 69. Take Exit 264A. Facilities: Foss State Park has over 22 miles of multi-use trails. Summer Camping: Mouse Creek is the equestrian campground with 9 - 30 amp RV sites, 5 pens, water, restroom, campground overlooking the lake. Summer office hours are Sunday-Saturday 8-4:30pm. Location: From I-40 take exit 53 North 7 miles to Foss State Park. Facilities: Electric hook ups. Barn with hot and cold water. Stall or turnout or both. Plenty of parking for LQ rigs with generators. 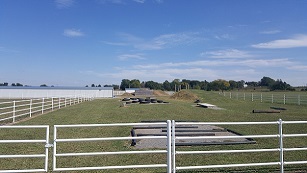 Outdoor arena and round pen. We are family-friendly and have a shaded pavilion with picnic tables, games of horse shoes and corn hole and "hay stacked" roping dummies...just for fun! Location: Two miles south of I-35 and Hwy. 33 off Midwest Blvd. in Guthrie, OK. ~ 4 miles north of the Lazy E Arena. Facilities: Family friendly, clean & professional overnight or vacation boarding facility. Less then 3 miles from I-35 (Exit 151); hard top road all the way! 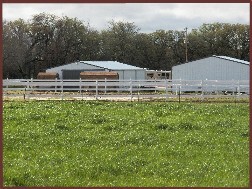 Stalls, private pasture & separate paddocks with shelters from which to choose. 4 new 30amp electrical hook ups, dog kennel & picnic area. RV park 1.8 miles away, Lazy E Arena is 6 miles, OKC Fairground is 30 minutes, Oakridge Equine Facility is 4 miles. Easy in/out with 2 gates, no need to turn your rig around! Reserve early for popular events at the Lazy E; spots fill up quickly (NLBRA, Red Dirt Roping Series, Barrel Bash & more). Thanks for looking and I hope you have a safe & blessed trip! Donnajayne Noble. Location: Easy access to and from I-35, exit #146 or #151. Black top roads all the way. Easy access to the Lazy E Arena and Oklahoma City. We offer our facility as a refuge for natural disaster evacuees. Facilities: Ranch for short stay or long, race track options, or indoor arena next door. Training Center with 150 stalls, 3 round pens of different sizes, turn out pastures, 3 turnout paddocks, 1 grass arena. Indoor exercise area in barns, each barn has 2 wash areas, hay storage, 4 tack rooms, has roll up canvas for fresh air and views, walkers. RV full hookup, furnished dorms with showers and laundry mat. Gorgeous gated, secured, farmland. Location: East of Tulsa and within easy access to and from Route 412 and Route 69. 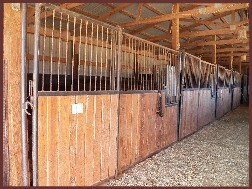 Facilities: 13 indoor pipe stalls, 6 holding pens with electricity and fence, 4 acre pasture. Water/electricity/parking and 2 rooms. We prefer daylight arivals. Big rig access. Facilities: 32 stalls, 4 outside pens. Location: Easy on and offf from I-35. 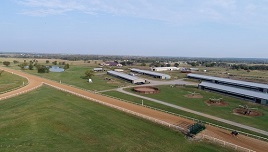 Facilities: Large riding arena (with lights for nighttime rides), round pen, wash rack, trailer parking, stalls, outside turnouts with and without loafing sheds, on-site monitoring, on-site professional trainer, mare and foal stalls, hay available, accessible 24-hours, close to Oklahoma State fairgrounds, close to main highways (40, 44, 152, 35, 240, and 4). Fully operational vet-barn, and much more. $30 per horse per night. We have trailer parking with electric for an additional $35.00 per night. Location: Easily accessible to most major highways, 10 minutes from Heritage Place sale barn, 15 minutes from Oklahoma State Fairgrounds, and only minutes away from several area hotels. 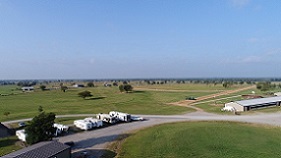 Facilities: You do not have to leave your horses at a strange place & worry about them while staying in Oklahoma City. 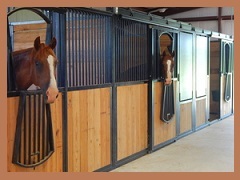 Stay in the barn across the aisle from your horse in a room with all the comforts of home. We have two rooms, one with 2 twin beds & one with a queen-size bed where you can lay your weary head. These rooms are very clean & we have a continental breakfast basket, with coffee pot & all the condiments already in your room. Bottled water & fruit juices are provided in your refrigerator. We have an 8 stalls barn with walls that are concrete & iron bars with pipe runs coming off the back of each stall with shavings included. Several pipe & cable paddocks including a large riding arena & round pen are available. We have a large well lit turn around area for the larger rigs & hookups for RVs & trailers with living quarters. We also have a large fenced area for turning out your dogs. I will be checking for current health papers and a negative Coggins test and I will not allow any horses to unload on our property for any reason without these papers. Location: I-40, exit Douglas Blvd S. from W; exit Anderson Rd. from E. We live right next to I-40 so finding our place is very simple & only takes 5 minutes to get to from exit 162. No restrictions on arrival times-we are open 24 hours a day - 365 days a year. Facilities: Welcome to Joyful Noise Farm. Joyful Noise Farm was established in 2008 from the love of a wife and a dream to ride the country side together. Joyful Noise Farm is a family owned private facility with a sole purpose to serve others and their horses on their way to successful Horsemanship. Hospitality is our main goal with the best for your horse in mind. Joyful Noise Farm offers SoftStall ™ in each of the indoor stalls, automatic waterers (heated in the winter), and 50 ft runs for his/her morning exercise. We also offer full RV hookups with dump station. We can accommodate any size rig, large or small, we can host them all. We have 24 hour surveillance of property and in each stall. If you would like to stay with your horse, across the hall is our intern room available for $50/night. With the intern room, we also offer a stocked hospitality room and full bathroom with shower facility. Stalls are $30/night or outside stall/run combinations are $25/night. The best hay and/or alfalfa available and your favorite feed upon request. We also offer extra shavings to purchase for your trip, if needed. Joyful Noise Farm offers boarding and pasture boarding with a lean-to. Please call for availability and monthly pricing. Joyful Noise Farm morning activities can include, by appointment only, the use of our outdoor obstacle course, our 120’x 240’ outdoor arena that has certified Kiser footing. 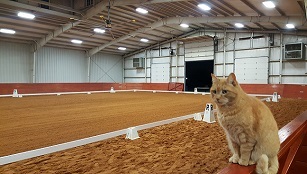 Our 100’x 200’ indoor arena also has certified Kiser footing with dressage letters available. We are happy for you to exercise and/or groom your horse before you leave. At Joyful Noise Farm, our staff will take care of everything while you stay at our facility. The only thing you and your horse need to worry about is a good night’s sleep. A current negative coggins and health record are required. Unmanageable or incompatible horses, which create problems for the barn, clients and their horses, or destroys barn property will not be eligible to board and must be removed from the property immediately. Horse owners are financially responsible for any damage to the facility by their animals. All boarding charges are due upon arrival. Location: We are conveniently located 3 minutes from the local Wal-Mart and 4 minutes away from Hwy. 69. All roads that lead to Joyful Noise Farm are 18-wheeler accessible. Our parking lot is fully lit for you to see where to park and unload your horse(s). 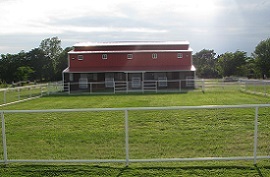 Facilities: We have a 1.5 acre fenced in pasture area with a horse barn that is open on one side. There are (2) - 14' x 24' pens that are half under roof. A water hydrant, lights, and electricity are provided. 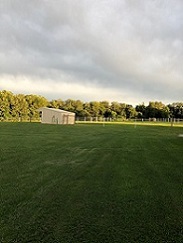 The facility is located on our beautiful, quiet, family run KOA campground property. We offer Cabins, RV sites and Tent sites for your convenience. The horse facility is located 600 feet from the edge of the cabins/sites. Horses need to be walked to the pens/pasture. Rates: $25/horse/day ($20/horse/day when combined with site/cabin rental). Accommodation rates vary depending on type. See our website or call for more details on accommodations and amenities at our park. 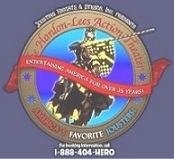 Horses and accommodations MUST have reservations made by phone as space is limited. 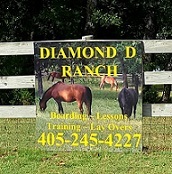 Facilities: Horse boarding on a daily or monthly basis. 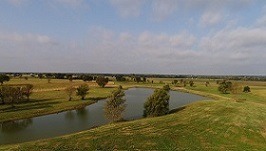 Rolling hills, shade trees and a 5 acre lake stocked with fish await our guests. 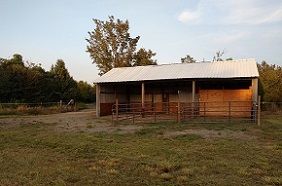 Barn includes 10 box stalls and wash rack. Six pull through RV sites with 30 and 50 amp hook ups. Plenty of room for big rigs. Six large pens for multiple horses. Large sand arena and miles of horseback riding or hiking trails. 24 hour video surveillance cameras. We are only 6 miles from the Shawnee Expo Center just off I-40. 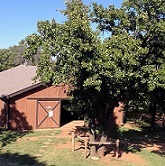 Lodging available at the ranch or in Shawnee six miles away. Location: I-40 to exit 192 (Earlsboro), head north 1/8 mile to the first gravel road on the left. Take the gravel road west 2 and 1/4 miles; our ranch is on the right. Facilities: Open to travelers with or without horses. Well behaved dogs allowed. Peaceful setting for walking or riding your horse here on the property. Many beautiful trail riding areas close by. Trail guiding with options. Lessons available for you and your horse. 20 minutes to Siloam Springs, Arkansas, Double R&P, Restaurant, gift and gun shop shop located one mile from your room. Their Friday night steak night is a MUST! For people traveling with horses, our per night fee is $45 for the room. RV hook ups are $30 per night; horse stall/paddocks with shelter and shavings is $30 per horse per night. Horse care & wash bay. 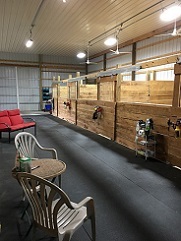 Facilities: Recently completed 8 stall barn with 12' x 12' stalls; hot/cold wash rack, turnout pens and pasture board; small outdoor arena, new 60 ft. round pen and 160 acres for pleasure and trail riding. Owner/operator lives on premises. We also sell nice AQHA babies. We are in the middle of wheat and cotton farming located in a quiet rural area. Location: We are 6 miles north, through Yukon, Oklahoma, on Cornwell, which becomes State Highway 4 at Main Street to Britton Road (flashing light). 4 miles west on Britton Road, and 1 and 1/2 miles back north on Cimarron Road. We are also easily reached from the NW Expressway. 2 1/2 miles south on Cimarron Road to 11630 North Cimarron Road (only house on the east side of road). Call for directions if you need to. We will be glad to help.